Co-Founder, CTO @ Applicate IT solutions Pvt. 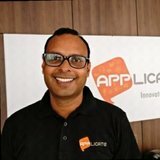 Ltd.
Current - Co-Founder, CTO @ Applicate IT solutions Pvt. Ltd., Past - Senior Engineering Manager @ Avaya India Pvt. Ltd.
Do You want to chat with Madhusudan Atmakuri ?